South African author and prolific letter writer. Olive was a feminist, socialist, pacifist, vegetarian, rational dress advocate, anti-vivisectionist would-be doctor and thinker, you name it she had a position on it. She corresponded with everyone, from Edward Carpenter and Havelock Ellis to Emily Hobhouse and her best friend Elizabeth (Betty) Molteno and her partner Alice Greene. All Betty has been to me I can’t tell you. Her beautiful wonderful individuality is such a joy to me. It seems almost all that is keeping up my faith in Humanity now. What a wonderful soul it is. It is so beautiful that I am able to love you both so that my love for one never seems interrupted by my love for the other, and I know you both love me. I have a fondness for Olive – I’ve read two of her novels, The Story of an African Farm, and From Man to Man and enjoyed them. I wish I was large and strong and could put my arms round all the tired lonely women in the world and help them. The work of my life is to try and teach women to love one another. If we would leave off quarrelling with men and just love and hold each other’s hands an would come right. Oh, I love the two women in my book so I am getting to love women more and more. I love men too, so very much only they don’t need me. The woman I love best in the world, & who I think loves me better than anyone else has written to me ten times or more on political & social questions since I came out here: I have written her two post cards. yet if tomorrow I wrote “I need you” she would leave her husband & home & come to me, & if she simply hinted that she needed me, I should be in England in three weeks. I know that my name is so sacred to her that she never dis-cusses me with anyone, & I never mention her & it would be over my body that anyone should touch her; but I don’t feel I want to write to her, it is she who must give me food for thought in her large interesting life in the centre of political & social thought & action, & I would much rather she was doing her great work in England than hanging round in Africa where she could not be of so much use. All quotes from letters © Olive Schreiner Letters Project. So while I don’t think Olive was exactly one of us, she was certainly a fellow traveller, and she gets an invitation to the party, no question. 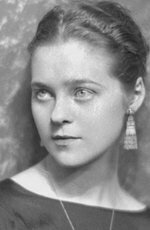 Eva was an actor and producer, born in England and who became part of the milieu of lesbian actors in Hollywood, performing herself on stage as Emily Dickinson, Peter Pan Elizabeth I and Hamlet with great success. in 1980 she earned an Oscar nomination for her work in the film Resurrection, at the time she was the oldest Oscar nominee. Eva had affairs with many of the members of the ‘sewing circles’: Alla Nazimova, Tallulah Bankhead, Beatrice Lillie, Laurette Taylor and Mercedes de Acosta. In 1927 Eva was named as co-respondent in the divorce of her then lover Josephine Hutchinson. People hate what they don’t understand and try to destroy it. Only try to keep yourself clear and don’t allow that destructive force to spoil something that to you is simple, natural, and beautiful. In the late 1930s Eva started a relationship with theatre director Margaret Webster. and they later founded the American Repertory Theater together. She also later had a relationship with Marion Evensen. Alice French was an american writer of stories, journalistic essays and novels, using the pseudonym Octave Thanet – she chose Octave for being non gender specific. In 1883, Alice and her widowed friend Jane Allen Crawford set up home at Clover Bend Plantation in Lawrence County, Arkansas. They lived there for several months each year holding literary and social entertainments. Alice had a woodworking shop, where she built shelves and furniture, and a darkroom, where she developed and printed photographs. Her stories were very successful,but unfortunately Alice, like many other writers of the time, was casually racist and xenophobic, and firmly looked down on people she considered her social inferiors. She even went to the trouble of speaking against women’s suffrage. Late twentieth century reading of her stories has found some sympathy for the conditions of women, and even some well hidden lesbian themes. Not really good enough for me. Alice doesn’t get an invitation.